We covered the changing monitoring landscape and what it means for organizations looking to replace “The Big Four.” For some, the answer is to consolidate their existing tool set; but is it enough? In a direct response to the need to move faster and increase organizational agility, companies are hurriedly adopting technology and serverless architecture that can appear – or disappear – in the blink of an eye. These technological advancements represent a sea change compared to their sedentary counterparts, but they also bring an added layer of operational complexity because their transient nature can make it difficult to track whether they’re operating or dormant. Once upon a time, you used to be able to use manual processes to account for a device’s whereabouts, but those days are long gone. Thanks to the advancement of modern neural nets like artificial intelligence and machine learning, you can track today’s ephemeral technologies and take a real-time inventory of your cloud(s), vendors and tools. The key caveat, however, is the ability to see the changes – – in real-time – – as they happen rather than rely on an expired snapshot in time. In addition to possessing a real-time view of your infrastructure and applications, today’s organizations need to put AI/ML technology to use in ways that will enable them to automatically discover and show how their IT ecosystem and cross-domain resources are working together. By identifying the relationships taking place within the IT ecosystem, organizations will be able to readily identify opportunities for automation, which will improve their service delivery, drive efficiencies, and minimize risk – all while supporting the performance and availability of critical services. Let’s be honest: nobody is going to rip and replace a Big Four platform overnight. For one, the platform is probably too intertwined with your technology, staff and processes. As was probably the case with every upgrade you’ve implemented, there’s usually a slow and tedious process in place where you look at what’s broken or outdated and try to fix that problem first. So, what’s the solution? Integration! To successfully make the leap, ask monitoring vendors if their platform can be deployed alongside your existing solution. If they say yes, then ask if the integration will support multi-cloud and hybrid IT environments. 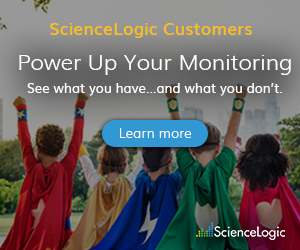 Here at ScienceLogic, we’ve developed a new PowerPack to keep our customers current and to ensure they continue to get the best return on their investment. The PowerPack instantly adds value because it identifies the number of devices currently being monitored by various technology types (including networks, servers and operating systems, storage, cloud, unified communications and wireless LAN). The PowerPack also gives the ScienceLogic system administrator instant visibility into usage rates and enables license compliance – however, it also highlights interesting gaps in usage. We often find that customers buy multiple monitoring tools and incur significant licensing and training costs, not to mention the operational burden of inconsistent processes, arising from tools sprawl. The new PowerPack shows instantaneously where ScienceLogic is not being applied, revealing an opportunity to consolidate other tools and move other technologies onto ScienceLogic. Why Move New Devices and Technologies onto ScienceLogic? Add network visibility for a view of bandwidth consumption at major VMware hosts. Understand the level of traffic to and from storage arrays. View and prove there is no slow down on links by adding a real-time view of storage array capacity and latency – you may have a capacity issue, not a slow network. Visualize connectivity between virtual machines and their associated storage – neither a virtualization manager nor a storage manager can see each other’s managed assets. 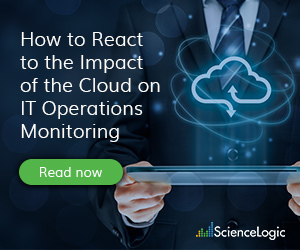 Intermittent connectivity between them can cause major application performance issues that only a cross-domain system like ScienceLogic can diagnose. Gain a view of your AWS and Azure accounts and determine top cloud compute instances across either or both. A single cloud tool from either provider gives you a one-sided view. Add on-premise database visibility to a view of cloud-based web servers to gain a holistic view of hybrid IT infrastructures. The ‘Big 4’ platforms struggle with multiple clouds, and cloud tools cannot view hybrid or on-premise components. Add your WLAN devices into existing WAN/LAN network monitoring for a complete view of all network assets. The Biggest Reason to Move all Monitoring to ScienceLogic? Business Services! 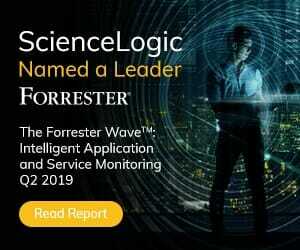 Perhaps the biggest reason to move more devices and technologies onto ScienceLogic is to move away from an infrastructure-centric view of IT and finally start managing at the Business Service level. Once you have data from all of the elements of an IT service or business service in the SL1 platform, you’ll gain real-time visibility into the health, availability and risk of the core services you deliver. Despite previously being an intensive manual process, now you can create IT service views quickly and track changes accurately – and automatically. You can also develop executive dashboards to drill-down and expose the technical metrics to the teams that need them without cluttering the executive views with too much arcane detail.